Welcome to www.TGIFunky.com: 4800 Technics of Funk! TGIFunky! 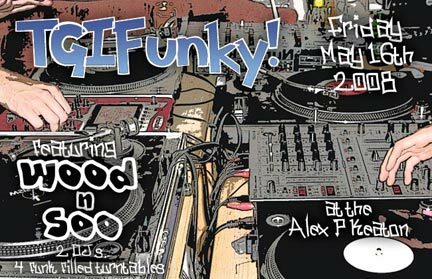 celebrates the long weekend with a night of funky music featuring Vancouver DJ's Wood 'n' Soo (http://www.woodnsoo.com/) mashing things up live on 4 funk filled turntables!! London's Skank Honto (http://www.skankhonto.com/) will be warming things up earlier in the night with a blend of nothing but the funkiest breaks tunes! for a sneak peak of whats in store check out the mixsets linked below!